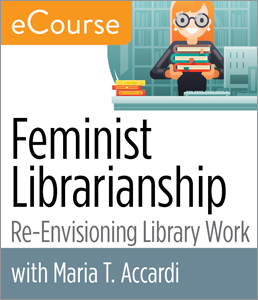 Chicago—ALA Publishing eLearning Solutions announces a new facilitated eCourse, Feminist Librarianship: Re-Envisioning Library Work. Maria T. Accardi will serve as the instructor for a 4-week facilitated eCourse starting on Monday, July 2, 2018. While the term “feminist pedagogy” is commonly associated with the academic world, its implications for libraries are much broader than that. With its focus on inclusion and social justice, people across the library profession have much to gain from learning about librarianship from this perspective. This 4-week course enables you to define feminist pedagogy, identify its relevance for social justice activism in libraries, and identify implications for your professional practices, no matter your library setting. Through assigned readings and engagement in weekly discussion board prompts, you will explore feminist pedagogy as a lens to re-envision library work in reference services, collection development, cataloging and classification, access services, and more. The course design enables and facilitates quality interaction among all participants and employs feminist pedagogy as a tool to model what it looks like in action. This means that you will work together to build knowledge; experiential knowledge will be validated; and student voices will be valued. Maria T. Accardi is Librarian and Coordinator of Instruction and Reference at Indiana University Southeast, a regional campus of Indiana University located in New Albany, Indiana. Maria holds a BA in English from Northern Kentucky University, an MA in English from the University of Louisville, and an MLIS from the University of Pittsburgh. She served as a co-editor of and contributor to Critical Library Instruction: Theories and Methods (Library Juice Press, 2010), and is the author of Feminist Pedagogy for Library Instruction (Library Juice Press, 2013), for which she received the ACRL Women and Gender Studies Section Award for Significant Achievement in Women and Gender Studies Librarianship in 2014. She lives in Louisville, Kentucky. She is also the editor of The Feminist Reference Desk: Concepts, Critiques, and Conversations (Library Juice Press, 2017). Registration for this ALA Publishing eLearning Solutions facilitated eCourse, which begins on July 2, 2018, can be purchased at the ALA Store. Participants in this course will need regular access to a computer with an internet connection for online message board participation, viewing online video, listening to streaming audio (MP3 files), and downloading and viewing PDF and PowerPoint files.